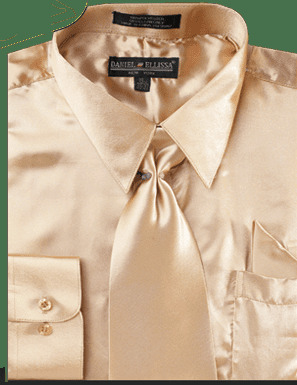 Mens Taupe Champagne Color satin dress shirts are one of the easiest ways to make heads turn at a special occasion. We have so many colors of satin dress shirts you can't go wrong. The easiest way to stretch your suit wardrobe is by wearing different color dress shirts with your dress suit collection. Satin shirts are a great addition to your fashion wardrobe.Many people who are looking for a Champagne Color silk shirt for men are really looking for a satin shirt. With a satin shirt and tie set, you can take even the more mundane looking of suits and totally make your ensemble come alive. It's just that easy. Don't rent when you can own your very own Tuxedo for a cheap price. Our Mens Suits will astound you with the variety and style.